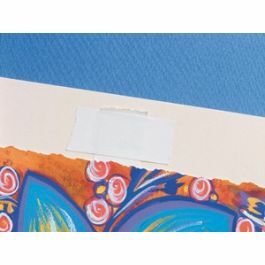 This Self-Adhesive Linen Hinging Tape by Lineco is ideal for hinging artwork, posters, and mats to backing boards. GLHT3 comes in a roll that is 400" long (35 ft.) and 1 1/4"wide. 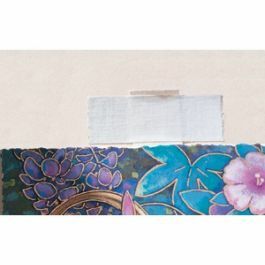 This white linen tape is made from a strong, high thread cotton and creates a flexible, permanent binding. 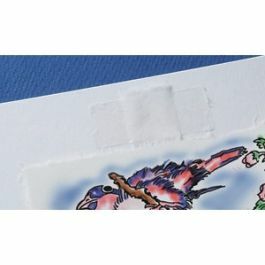 Self-adhesive is acid-free, non-yellowing, and is attached to a white peel-away liner. Our GLHT3 Self-Adhesive Linen Hinging Tape by Lineco provides an easy way to hinge paper artwork and mats to backing boards. The rolled linen made from high thread cotton is 400" long (35 ft.) and 1 1/4" wide. Ideal for photos, prints, posters, awards, and paper artwork. Create permanent binding for mat-to-mat or print-to-mat hinging. This tape also works well for mending and reinforcing books, folders, and envelopes. 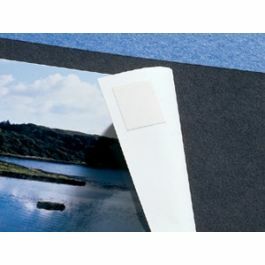 The acrylic self-adhesive is non-yellowing over time and is attached to a white, peel-away liner that is simple to use. Adhesive can be removed with mineral spirits. As this linen cloth is thin and fine, its is difficult to reverse adhesive and is not recommended for direct contact with valuable artwork. Acid-free. The primary use of GLHT3 is for hinging window mats to mounting mats. It can also be used to reinforce folders, books, and envelopes. This tape is not recommended for direct contact with valuable artwork.